For PSA it is obvious that the only thing that provides strong adhesion is dissipation. The surface energy of the system makes no difference to the measure peel provided it is sufficient to get wet-out of the PSA in terms described in Dahlquist. The famous fact that silicones can provide release liners is nothing to do with their surface energy (F-surfaces of the same surface energy give poor release and there are many excellent silicone PSAs), and everything to do with the fact that the surface is "fluid" and allows no dissipation (a fact proven experimentally). When it comes to entanglement (whether it's polymeric or via cross-linking) the Lake & Thomas formula shows a strong amplification of adhesion because a lot of the adhesive has to move and stretch bonds before any one of them will break. Such movement is likely to be accompanied by much dissipation. Intermingling is also likely to produce some broader polymer motion as things are pulled apart, giving dissipation and therefore a stronger bond than expected from the de Gennes formula. 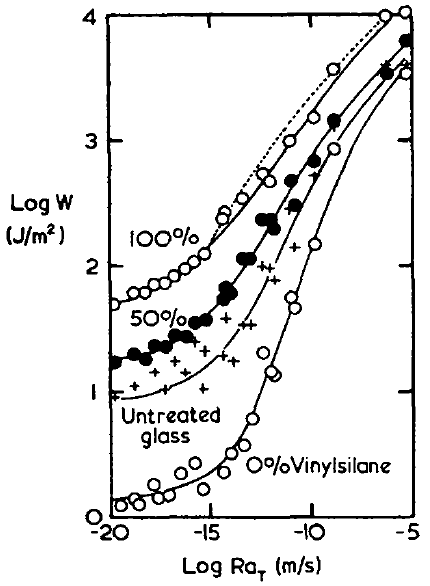 But it turns out that if you cure a pure rubber in contact with glass and test the adhesion, at any reasonable peel rate you get a Work of Adhesion orders of magnitude higher than can be explained by surface energy. The famous paper of Ahagon1 (the data are those that are used in the WLF page and the other lines are discussed further on the Chemical Bonding page) provides a typical example of this effect. The line marked with + symbols is one involving no chemical bonds - just the interaction of the rubber with the glass. At low peel speeds the bond is still 10J/m2, 50x larger than surface energy, and at high speeds it is >1000J/m2. The adhesion community all agree that "dissipation" is involved, but what that actually means is seldom clear. The word "viscoelastic" appears regularly, but with little effort to explain further. But the point is that for many adhesive situations there are strong effects of velocity on peel. For intermingled and entangled adhesion there are similar large effects. And even for modest adhesion, it is said that polymer chains near a surface are "constrained" by the surface and start to move (absorbing energy) once attempts are made to remove them. 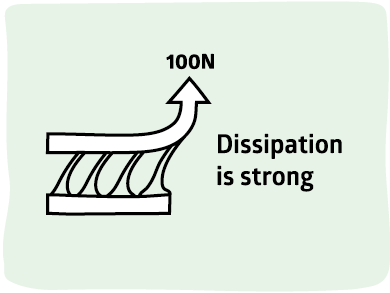 It would be transformatory for the world of adhesion if "dissipation" were discussed much more than "surface energy". However, "dissipation" is obviously complex while "surface energy" sounds scientific and can give the illusion of being readily measured so it remains much more popular, even though it is nearly useless in terms of insights into strong adhesion.